If blogs have played a big role in online advertising, online video marketing can also bring huge impact to your business. However, some small businesses seem to still be hesitant in trying and utilizing the power of web videos. They fail to see what it can do to build their company’s brand – because building the brand will actually lead to an increase in revenue. 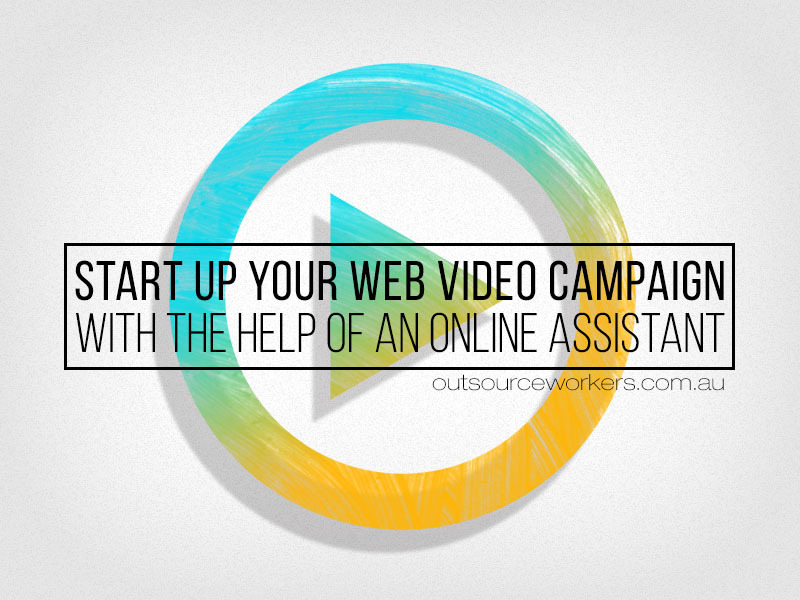 In this article, we will present you some useful tips and strategies on how to start your web video campaign with the help of an online assistant. One of the top reasons why some entrepreneurs are hesitant in creating videos is because they don’t know what kind of videos to present to their audience. Quite simply, and just like any other forms of online marketing (as blogging is), you need to present solutions to problems commonly asked by your audiences or clients. You can also introduce your company’s services and products which will provide your target market an idea on how you can help them. As soon as you have started your online video, you’ll be flooded with enquiries and you’ll sure come up with a follow up video about your first web video. Brainstorming ideas with your online assistant will help you find out what help your customers and target market needs. You can ask your online assistant to list down every single idea because this list will be the source of your video content for the following months or for the years ahead. Determine the most frequent questions you are being asked and consider creating a series of videos to answer all issues. Since you now have created a list for possible content, note that you need to check whether what’s on your list is indeed a demand or not. Through this, you can organize and prioritize which needs to be tackled first. More and more possibilities can come your way when you start into video marketing. You can also do product reviews, walkthroughs or tutorials, and a lot more. Keywords are also important in video campaigns. Keywords should be thoroughly picked to ensure that you maximize search results not just on Google but also in You Tube and other search engines that you prefer. Search for long tail keyword phrases that you can optimize posts for with some solid SEO principles. You can also ask your online assistant to make at least 4-5 keywords or key phrases for each content idea to obtain maximized search results. The more that your online assistant can find good keywords and key phrases to put in your video descriptions, the more you can create traffic online. This task is something better done by you, since the content should come from you. It’s your experiences, your expertise, and your know-how that people are tuning in for. If you are not really comfortable in front of the camera, then you can ask one of your employees to do the videos for you or you can hire a freelance talent to appear on your video. There are also agencies that you can contract for your video production. Now that you have the raw materials for your video campaign, you can now ask your online assistant to trim the edges or do a little trick on your video like adding titles, transitions, and some cool music to add life to your video. Your videos should appear as entertaining and engaging as it can possibly get. Always remember to add your page’s link or your contact details to let your audience easily connect with you. You can have your online assistant upload your videos for you. You Tube comes next to Google as the most popular search engine. If you have uploaded your videos on You Tube, your videos have the potential to be exposed to millions of viewers daily. There’s also Vimeo, Vevo, Daily Motion, etc. but most importantly do not forget to upload your video on your website and blog. Now that you have your video uploaded on YouTube, you just don’t let it hang there. Your online assistant can help you promote your videos through sharing in different social media channels such as Google+, Twitter, Facebook, Linkedin, etc. Video Ads Campaign is now becoming one of the most highly effective ways of marketing. It could add value to your business and help build a good brand online.